Fall is here! If you are the type of person that dreams about this time of the year, you are the type of person I can be friends with. Everything is magical: pumpkins everywhere, the chill and crisp air, the gloomy mood, comforting aromas: warm vanilla, spicy cinnamon, the sweaters and bonfires. Makes me all giddy just thinking about it. And this time of the year also means one thing: Halloween! Loved by many, misunderstood by some. I actually have a friend who said she hates Halloween. I mean, I HAD a friend who hates Halloween. She said the worst part about it is the CANDY CORN! I was shocked! Then I went to find out my husband also can’t stand Candy Corn. The only thing I could think of was: Why didn’t you both tell me this when we first met? “Hi, my name is John and I hate Candy Corn”. And I would say: “Bye, John”. 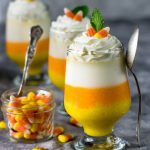 Either way, even if you don’t like Candy Corn, I can assure you this recipe I bring to you today tastes nothing like Candy Corn (well, except for the little candy corns I put on the top as garnish, just pluck them away). This is a recipe for a layered pannacotta. 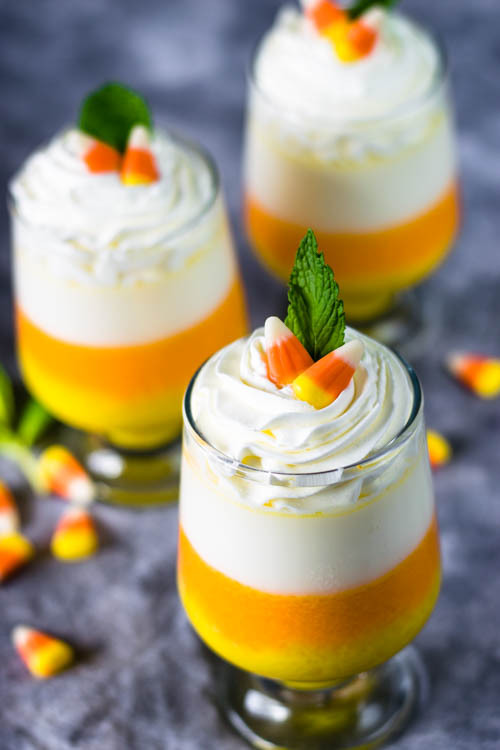 The bottom layer is a Pineapple Panacotta, the middle layer is a Mango Panacotta and the final layer, a Vanilla Panacotta. 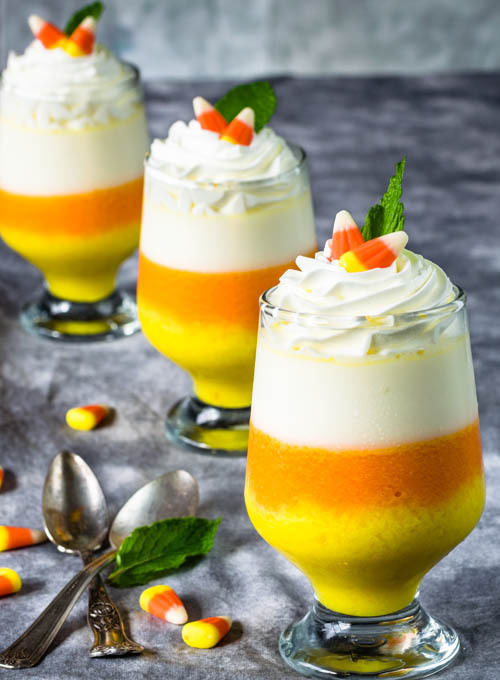 This pannacotta is fancy and will be a hit at your dinner parties this year! You should give it a try! 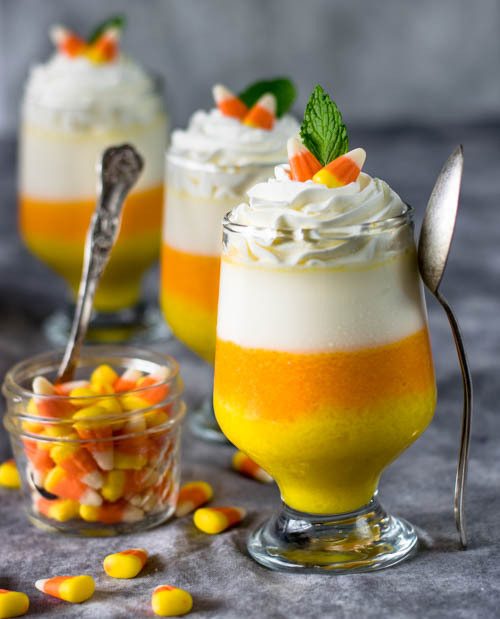 It will convince even your most candy-corn-skeptical friends! 12 ounces or 1 cup of crushed pineapples drained. Open a can of crushed pineapples and drain it. Then, process the crushed pineapples in the blender to smooth out a little bit. If using a pineapple, chop it then crush it in the food processor and measure out 1 cup to use. Add all ingredients to the bowl of a mixer. With the whisk attachment beat heavy cream on high until fluffy and stiff. Keep your eye on it so you don’t overbeat. Fit a piping bag with any large tips of your preference and scoop whipped cream in the bag. Pipe whipped cream swirls over vanilla panacotta. Garnish with a pineapple wedge a mango slice and a mint leaf. spouted measuring cup, I use my 8 cups measuring cup. Sprinkle 5 grams of gelatin powder over the water and let it hydrate for 5 minutes or so. Add 1 tsp of vanilla to the pineapple and stir, then pour mixture over gelatin and water. Mix ensuring the gelatin is dissolved. Get ready to pour into the cups. Each layer will be ¼ of the height of the cup that you’re using. ¼ for the pineapple panacotta, ¼ for the mango panacotta, ¼ for the vanilla panacotta and ¼ for whipped cream. Heat up the heavy cream with the vanilla seeds and sugar over medium heat in a small saucepan. When it reaches a boil, remove from heat and let it infuse for 30 minutes to enhance the vanilla flavor. You can skip this, but I highly recommend doing it. Put 2 tablespoons of cold water in a large spouted measuring cup, I use my 8 cups measuring cup. Sprinkle 5 grams of gelatin powder over the water and let it hydrate for 5 minutes or so. If you let your cream infuse with the vanilla, heat it up just a tad before mixing it in the gelatin. Pour the vanilla cream over gelatin and stir until all the gelatin is dissolved. Pour into little cups. Fit a piping bag with any large tips of your preference and scoop whipped cream in the bag. Pipe whipped cream swirls over vanilla panacotta. Garnish with a pineapple wedge, a mango slice and a mint leaf.